Sonoma Chocolatiers, in the central Sonoma village of Sebastopol, creates luscious hand-made chocolates, using organic and sustainable natural ingredients. Their dark chocolate indulgences include over 55 truffles, around 30 silky-smooth caramels and 13 chocolate bars and Nibbles. “We’ve considered changing our name to ‘Oh-My-God Chocolates’, since that’s the most common reaction we get,” claims partner and Chief Chocolatier David Gambit. David and wife, Susan opened Sonoma Chocolatiers in 2008, in conjunction with Infusions Teahouse, where over 100 organic teas and light meals are served up in a relaxed, Bohemian atmosphere. In beautiful downtown St. Helena you will find what House Beautiful magazine describes as “The best kept secret in chocolate is this little artisanal candymaker… Try a box of dominoes…”. 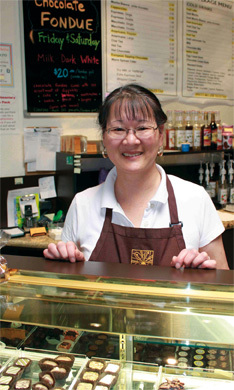 An intimate family business, Woodhouse Chocolate was also featured in Oprah Magazine’s “Favorite Things” list in 2011. The careers of founders Tracy Wood Anderson and John Anderson inevitably collided in the candy business. While Tracy was immersed in the food arts at the California Culinary Academy (after a stint at Domaine Chandon), John learned to recognize and evaluate fine and decorative arts of the last 500 years at a Christie’s Fine Arts Course in London. Between trips to Europe, Tracy earned a culinary degree, John and Tracy had two daughters and both helped John’s parents create a winery and vineyard of the highest quality, producing award winning Chardonnay, Cabernet, Merlot and most personal of all, Sparkling Wines. Nearly twenty years later, that part of their souls that needed to make wine was fulfilled and they decided to retire from winemaking. They filled that hole with their true love… chocolate. At Anette’s Chocolates by Brent, the sister-brother team is going on two decades of working together, creating award winning confections, truffles and sauces, as well as brittles, creams, and unique seasonal specialties. Anette’s has two locations just blocks apart in Napa, one at the culinary Valhalla known as Oxbow Market, the other the original location on 1st Street in Downtown Napa. The original location was also a chocolate/candy store. In fact one the siblings frequented the shop when growing up in this area. When they bought the store 18 years ago, Master Candymaker Ed Ratcliff agreed to stay on and pass down some recipes. What you get today includes many of those tried and true recipes, some over 70 years old, along with some new concepts and techniques created by Anette, Brent and Brent’s wife Mary (who focuses mainly on wholesale activities).